Over the years I have written extensively about various basic techniques, but it recently struck me that I have never sought to include a kind of "online lesson" of such techniques in my blog. Accordingly I will make this entry about "how to perform basic blocks". You will note that I generally use the term "block" but this is a force of habit: a more correct term would be "deflection", "parry" or "interception". Generally traditional blocks are used to intercept and redirect attacks rather than stop them dead in their tracks. In karate and other Japanese/Okinawan arts these techniques are classified as "uke". "Uke" comes from the Japanese word "ukeru" meaning "to receive". In this article I shall focus on the 4 main forearm blocks. I propose to deal in later articles with the question of why the forearm is the principle tool for deflections (rather than say, the palm). 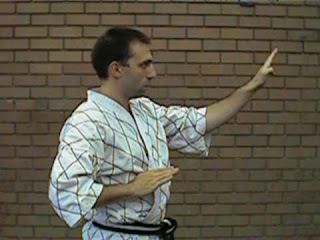 In traditional martial arts, the most common block is the rising forearm block. In karate this is called "age uke" ("age" meaning "rising") or sometimes "jodan uke" (upper level block). Start with one hand (in this case the right) in the pull back position, the other (in this case the left) in the finishing position. The finishing position is achieved when your forearm is angled down from the hand to the elbow, and away from your head (ie. your fist should be further from your head/body than your elbow). The middle of your forearm should be in line with your head and at least 2 fists away from your head. 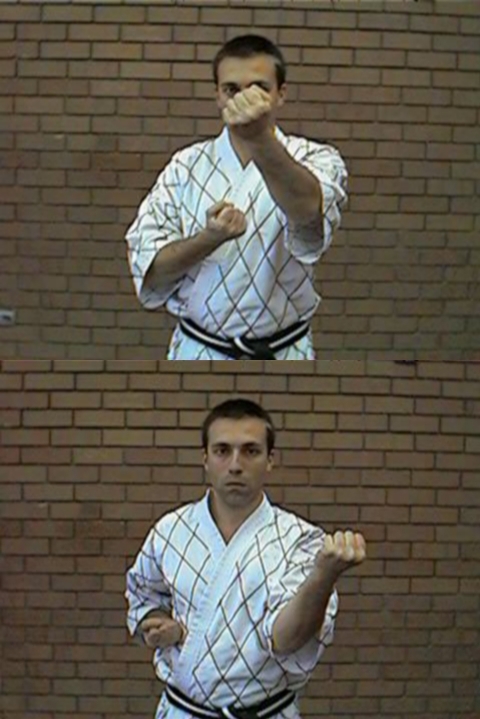 The forearm should be rotated so that the fist is angled at about 45º towards your opponent. Take care to tense the little finger of your fist to ensure a rounded edge to your blocking forearm. Bring your left elbow down, and at the same time bring your right arm across and in front of your left lower forearm to make a cross. Raise your right arm into the finishing position, taking care to delay the rotation of the forearm into its finishing position until the very last moment. Simultaneously, pull your left hand back into the full pullback position. The most common mistake people make in performing age uke is to have the forearm too close to the head at its finishing position. This has the simultaneous problems of leaving the deflection/interception too late and also too close to your face. 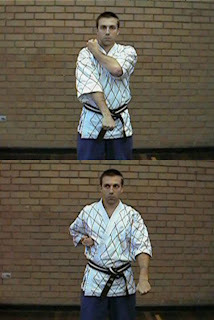 The chudan uke or chest-level block is a bit of a misnomer because the technique can be applied against high-level attacks just as easily as it can against chest-level. I suppose the "chudan" label is applied because it has a wider scope that encompasses the upper chest (but not the abdomen lower than the line drawn at the elbows). In karate, chudan uke has 2 main incarnations, as I discuss in the video below, namely the Naha te version (which is a deflection utilising a circle at 45º to your chest) and the shorin version (which utilises the rotation of the forearm to effect a deflection). Start with one hand (in this case the left) in the pull back position, the other (in this case the right) in the finishing position. The finishing position is achieved when your right elbow is one fist away from your ribs, your right fist is at your shoulder height and there is a 90º angle in your elbow and your forearm is angled at 45º to relative to your chest slightly outwards relative to your elbow. 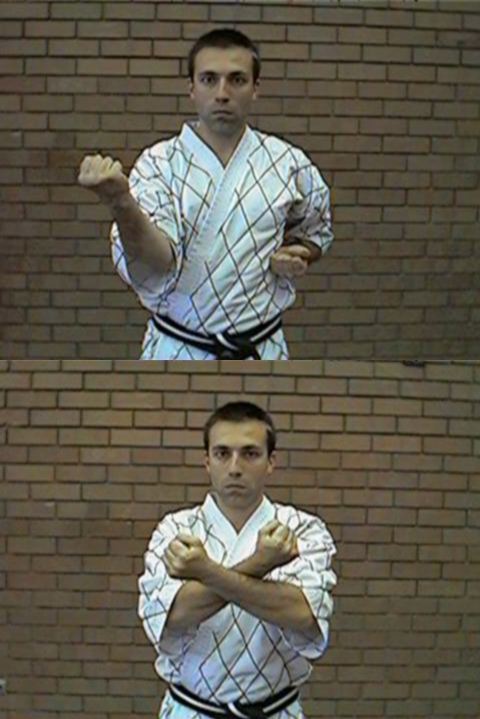 Bring your right fist back towards your chest and simultaneously bring your left arm out at a 45º angle relative to both your chest and the side to make a cross. You should take care to ensure that your left forearm goes in front of your right forearm. While pulling back your right arm, continue pushing your left fist outward on the 45º plane relative to your chest, but with a circular motion motion so that your left fist moves to the centreline. 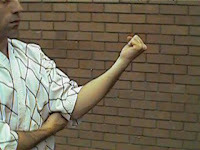 At maximum extension the middle knuckles of your upturned fist will be at your own eye level. Continue pulling back your right hand and inscribing the arc with your left hand until both reach the finishing position. It is very important to note that the Naha te version of the chudan uke is not performed as a "smash"; in other words it is not designed to knock an attack sideways. Rather it is intended to intercept and deflect an attack. Nor is there any reason to pause between the block and your counter. Rather, you should block and counter in one, continuous, rolling manner as illustrated in the above gif. As I have foreshadowed, the shorin chudan uke is performed with a rotation or "spiral" of the forearm. I describe this deflection in the preceding video, but in essence it uses the "spiralling" action of the forearm to deflect rather than a movement of the whole forearm along a 45º plane. There are pluses and minuses to both versions of chudan uke. It is even possible to combine them both into one movement, and many have done so. However, as I argue in my article "Chudan uke: to spiral or not to spiral" it is neither necessary nor appropriate to conflate the 2 in every instance and you run the risk of never understanding either properly if you do so. Hiki uke ("pulling" block) is also known as "kake uke" ("hooking" block). It is another "chest-level" deflection that is capable of being applied against high-level attacks just as easily. In terms of performance, the hiki uke is really quite the same as the Naha te chudan uke, except that both hands are turned over so that the palm is facing down. It is important to note that at all times the hand doing the primary movement (the main deflection) is parallel with the forearm which is at a 45º angle to your chest. At its furthest extension the 2 main knuckles (the ones you punch with) of the extended hand come to eye height. 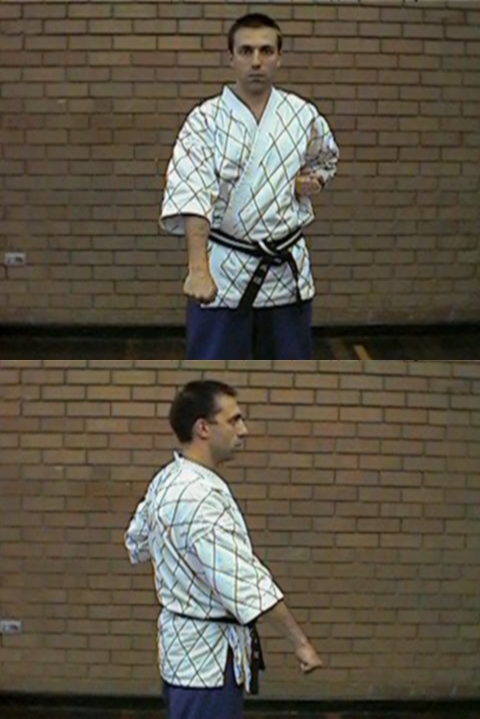 At the finishing point, those same knuckles are at the height of your shoulder and, as with chudan uke, your elbow is one fist distance from your chest. 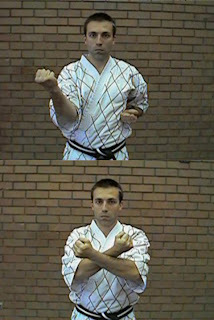 As with chudan uke, there are 2 main versions of gedan uke or downward block: the Naha te version and the shorin version. At the Academy of Traditional Fighting Arts we teach the shorin version first since beginners usually find it easier to perform and understand. The main difference between the 2 versions is that the shorin version is relatively linear, while the Naha te version employs a circular movement. The finishing position is achieved when your right arm is pointing downwards in line with your right shoulder, approximately 3 fists away from your right thigh. Bring your left hand up to the right side of your chin. At the same time bring your right arm in to the centreline so that your right fist is covering your groin. 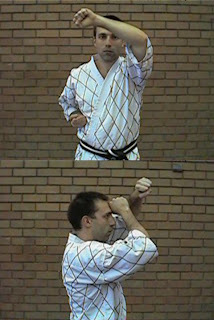 Simultaneously bring your left arm down into the finishing position while your right arm is withdrawn into a pullback. It is sometimes useful for brand-new beginners to imagine scraping something off their right forearm with the left (and vice versa when performing the movement with the other hand). The video below describes how to perform the Naha te version which we call "gedan barai" (low sweep) in order to distinguish it from the shorin "gedan uke". Essentially, the gedan barai is differentiated only by the circular path of the primary arm from outside to in and then down. Great article, I know many students will benefit greatly from your clear explanations and pointers. Maybe you can start an online dojo and charge for video testing :-) Just kidding!! I know you would never be a sellout, Dan; in this age of get rich training gimmicks it's good to know some still adhere to principle and share what they know freely. Thanks! No, I don't have any plans for commercialisation along these lines! I did note that my blog articles are often aimed at more senior students, so I thought I might provide something of use/interest to beginner students as well. Thanks Evie, I'm glad you find them interesting! Some of the discussions we've recently been having look at the concept of occupying the space or centre-line as a method for responding to an attack. From my perspective this seems a very different approach to the blocks described in the article. It's almost a 'seizing of the initiative' approach rather than a reactionary one which the formal techniques described appear to be. Is the apparent reactionary approach a facet of the karate approach or just one associated with the basic techniques shown? Hi Andrew - thanks for the question! (2) a movement of the arm off the control line after the interception which both (a) helps to redirect the attack; and (b) accompany the counter (which itself might take over the control line). Add to this body movement and you have the necessary ingredients for a successful defence. The issue of seizing initiative is quite different. If you can simply punch your attacker as he is raising his fist, this is preferable to waiting for the attack to be half-way to your face. However most civilian defence is predicated on the assumption that you don't have the luxury of such telegraphing of intention. More than likely you will face some element of suprise. Accordingly most civilian defence arts train some element of "reactive defence". "Blocking" (or "deflection") is necessarily reactive (otherwise you wouldn't need to deflect, you would simply strike). Accordingly, occupying the centre-line (or other "control line") is part of reactive defence rather than pre-emptive strikes or other "seizing initiative" methods. Even when deflecting and striking with the same arm (what some folks mistakenly call "simultaneous") is reactive. If you are having to deflect an attack you are reacting. The mistake most people make with karate or other "blocks" is that they assume they are used to "smash" an attack out of the way. Nothing could be further from the truth. Instead they all work by "intercepting" - ie. by occupying the control line first, then controling the attack and counter from there.